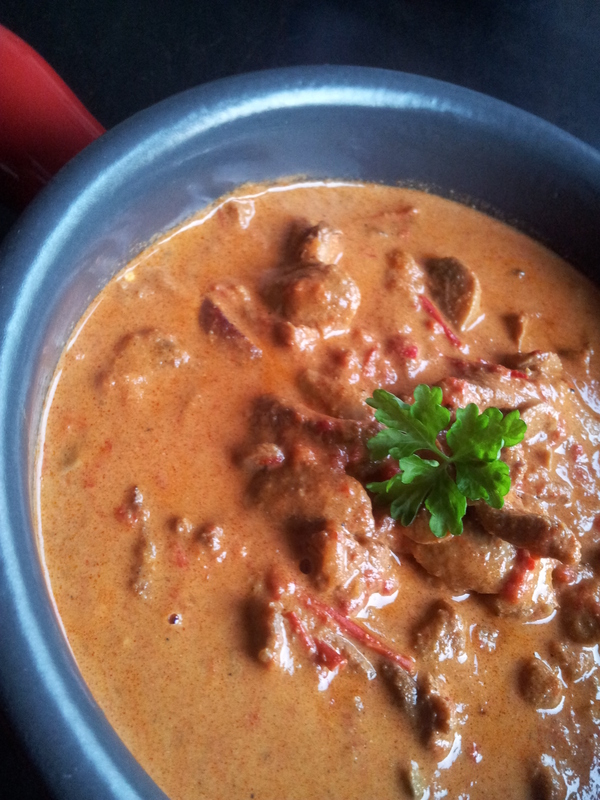 Strogonoff is one of my favourite things to cook. It’s not only simple to make, it’s also full of flavour, and it’s really versatile. About 600g of pork neck (or braising beef) cut into thin,long strips. 400 g of button mushrooms, sliced. Start by seasoning your meat with salt, pepper, paprika powder and chili flakes. Toss the meat in the spices so its well coated, then toss the meat in the flour , it has to be coated evenly. Then fry the meat off on hot oil, to sear the edges and juices. Fry until the meat is nice and golden. Don’t let the flour burn though, it will thicken the sauce later. Once your meat is brown put it aside and on the same oil fry off your onions, mushrooms and peppers. After 5 min (when the veggies are softened) add the meat back in, add your tomato puree and your beef stock.. cook until the meat is tender (about 1,5 hour with pork neck, about 2 hours with beef). At the very end the sauce should be thickened and reduced. Then add the sour cream and stir through well. Check for seasoning at the end.. then it’s ready. You can serve it with potatoes or bread, I love to serve it with tagiatelle pasta 😉 enjoy! 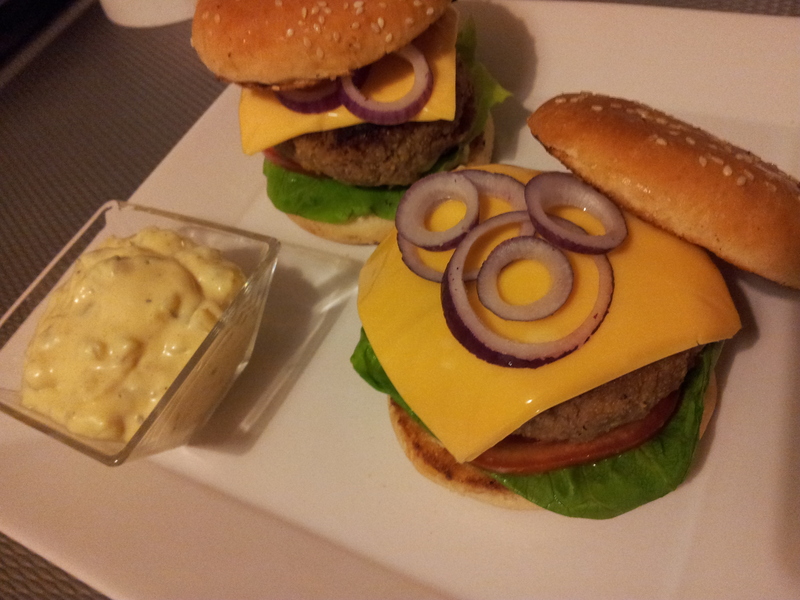 American classics part 2 – hamburgers !!! Optional toppings: lettuce, tomato slices, red onion, cheese. Now this is very simple, as most of the things I cook. All you need to do is mix your meat- preferably at room temperature with onion, and all the seasonings-season to taste and let it stand for a bit for the flavours to get to know eachother. 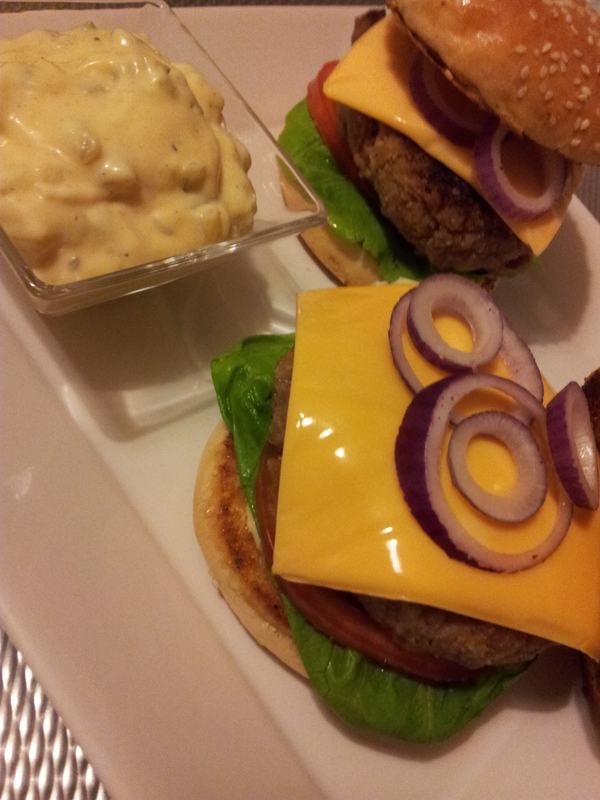 While the meat is developing flavour, you can prepare your toppings, I used tomatoes, lettuce,cheese and red onions. You can also make your special sauce but simply mixing all the ingredients together – then put it in the fridge until you need it. After 15-20 min take your meat and divide into even portions, form burgers- I like mine thick,and pan fry them- until they’re deep brown colour- if you want to make sure they’re cooked,you can pop them into the oven for a few minutes so they cook through evenly. Once they’re in the oven, toast off the buns and assemble- some special sauce, lettuce,tomato,burger,cheese on top and decorate with red onion. Serve with some extra sauce on the side! 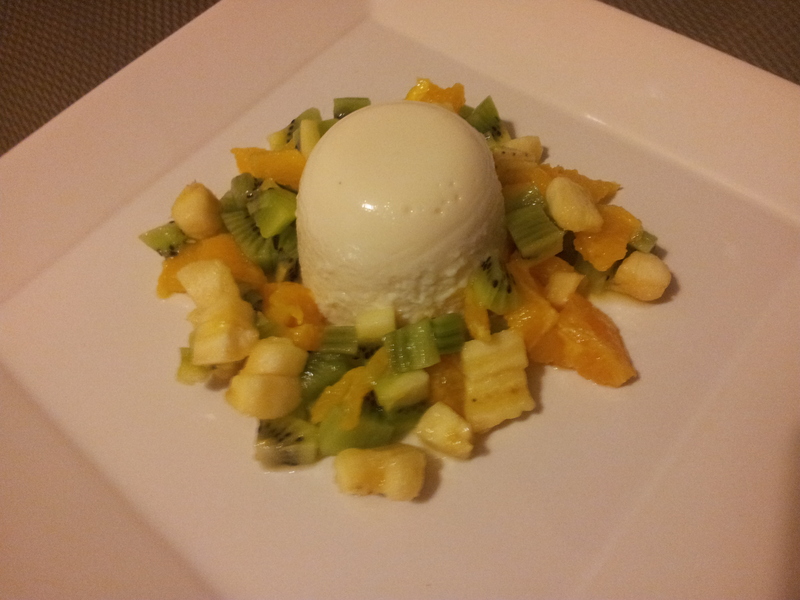 Panna cotta always seemed very complicated to me.I’m not sure why, it just did. So I never made it and never even attempted reading a recipe. Once I did, I realised- wow, this is dead simple. And I had all the ingredients on hand. Panna cotta means ”cooked cream” and that’s essentially what it is. Cooked, sweetened cream and milk, set with gelatine.. and the flavourings are up to you. 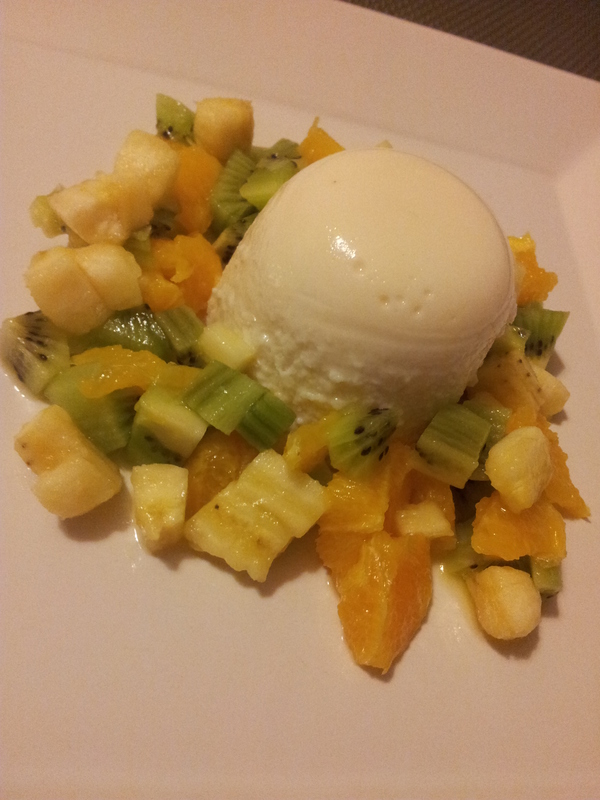 Today I used coconut to flavour my panna cotta and added a fresh fruit salade to go with it. I hope you like it. For the fruit salade I used 1 banana,2 kiwis and 1 orange- feel free to use any fruit you like. Put your coconut milk(or cream), milk, sugar and coconut, along with coconut flavouring into a pan and heat it up until the sugar disolves. Add your melted gelatine and stir it in well. Once it’s all combined you can strain the coconut,or leave it for texture. I left it in,for extra ”bite”. Pour the mix into oiled forms/ramequins (I used small coffee mugs, oiled with sunflower oil. Let them set for 4 hours in the fridge. Before serving, put the panna cottas in the moulds into some hot water, that will loosen them up,or ease the edge of panna cotta with a knife. Shake to get them out, place onto a plate and put the diced fruit around it. You can use vanilla to flavour your panna cotta..you can use coffee,chocolate,fruit or liquor. You can also serve with different sauces-chocolate, caramel.. it’s all up to you:) enjoy! 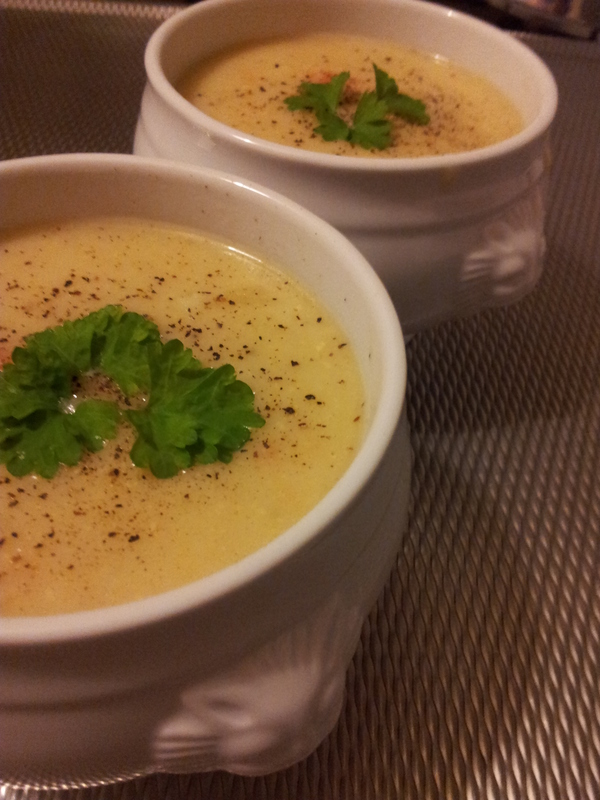 American Classic – creamy potato soup. Can’t resist it. 2l of chicken stock(or vegetable if you’re vegetarian). 200g of young cheese such as Gouda (Velveeta would work well too). Optionally- parsley or fresh chives to serve. Once that’s done, add your cream, stir everything so it’s well combined..then add the cheese and stir until all the cheese is melted and incorporated into the soup. Check the seasoning at the end, serve with a twist of black pepper on top – and some parsley or chives. Comfort food at it’s best 😉 enjoy!